shooting each other in a room about 100 square meters large. Virtual objects such as machine guns, ammo and medics are refreshed each time at different positions in the map during the game. Players move to exactly where the objects appear to get suppliment and watch firepower, objects, HP etc. through the augmented reality game environment. Start when player enter a certain area in the gaming map. 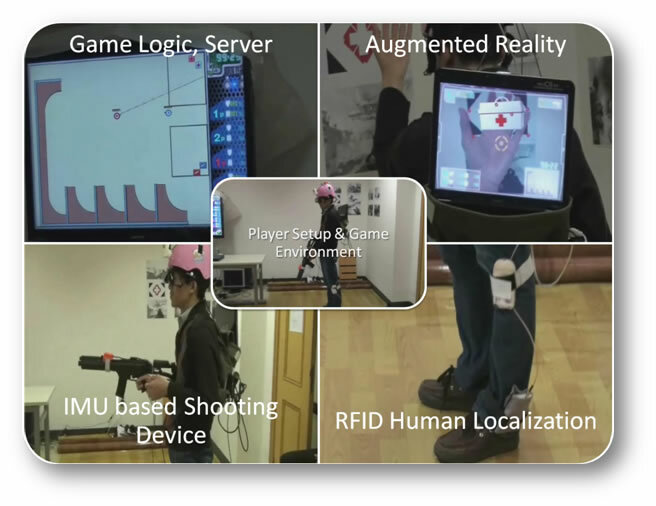 Using a monocular camera fusing information of a Xsens MTi IMU to get the pose of the players head. Use the localization result to render the virtual object such as guns and medics. To avoid the inaccurate measurement of the YAW of IMU, we developed a new algorithm which use only part of the IMU output to correct the localization result, making the realtime augment reality system more robust and convincible. Using RFID reader fixed at the player's leg to read RFID tag arranged at the foor, refine the localization result by an EKF to get a precise position of the player in the map.